This book systematically lists ...Read More. 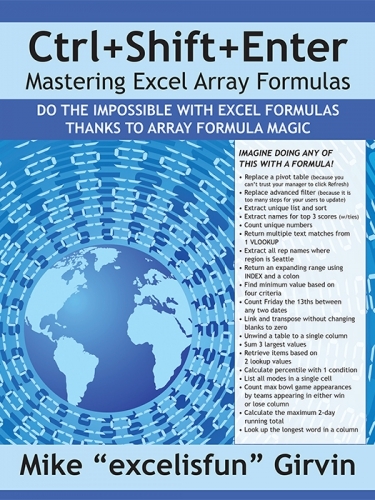 "The DVD 'Ctrl+Shift+Enter: Mastering Excel Array Formulas' is a separate product from this book. The two products cover the same broad topics related to creating efficient array formulas. However, the video has kinetic visuals of how array formulas work and less detail than the book. The book has a more complete story and systematic presentation of array formulas. 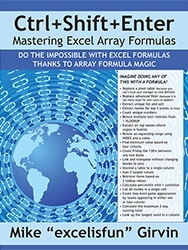 If you really want to master array formulas, study both the book and the DVD." Note: this version with the blue cover is a new improved printing in July 2016. We've tightened up the layout and added a few pages about Excel 2016 functions. But 99% of the book is the same book as the yellow/green cover.